Join us at NewBridge : Gateshead to chat about the future of the Programme Committee! As we head towards our 10thBirthday we are keen to look back on previous iterations of the Committee and talk about what it might look like going forward. It’s open to everyone, and you don’t have to be interested in joining the Committee or be a NewBridge member to come along. There will also be some homemade SOUP! The Committee is a vital part of our artist-led approach to programming, ensuring that many voices, interests and practices are represented through NewBridge’s exhibitions, commissions and events. 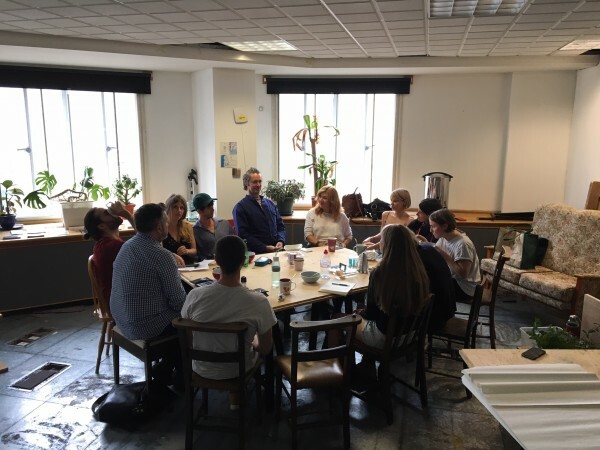 We aim to create a programme that reflects the diversity of contemporary artistic practice, through a process that supports members to have a hands-on, curatorial learning and development experience. The Programme Committee is always evolving, and we want to shape the next stage together. This event will be an open forum to discuss ideas, concerns, to answer and ask questions, so that we can collectively define what the next committee will look like. What should the Programme Committee look like? How can you get involved and what would you be committing to? Can you contribute without becoming a member of the committee? If you were to join the Programme Committee, what would you want to get out of your time? Are there any barriers to you joining Programme Committee? We are conscious that this is a volunteer opportunity, how do you feel about this? Past Committee members Andrew Wilson and Toby Lloyd will host the event which will be a totally open conversation, there are no bad ideas and there are no limits to the input you can have! If you are unable to attend but would like to feed into the conversation, then please email Niomi at n.fairweather@thenewbridgeproject.com and your ideas will be fed into the discussion. (8pm) Depart for the pub!